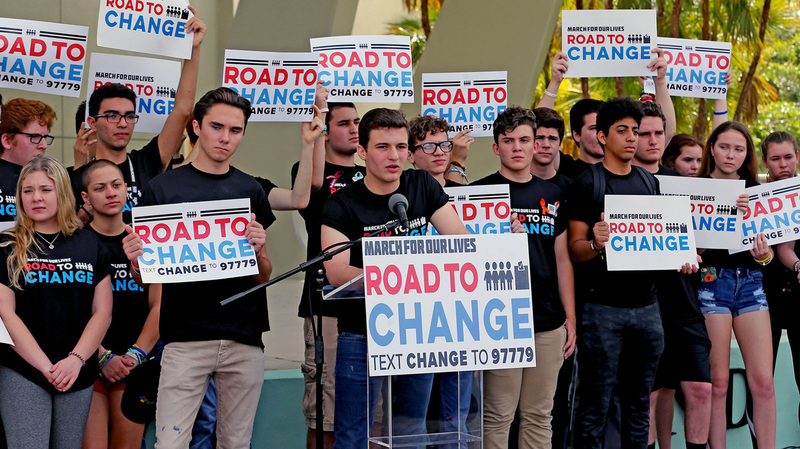 Parkland/March For Our Lives Activists Hit The Road To Register Young Voters Across The Country Student survivors from the shooting in Parkland, Fla., embark on a 20-state bus tour aimed at registering young people to vote, but this demographic typically sits out mid-term elections. The March For Our Lives movement is hitting the road this summer to register young people to vote ahead of the November mid-term elections. It's a voter mobilization effort aimed at getting young people registered and keeping them energized through the summer. A nationwide tour will make 50-plus stops in more than 20 states, including Iowa, Texas, South Carolina and Connecticut. The will also be a Florida tour stopping in all 27 of the state's Congressional districts. "The main purpose of this tour is not just to educate people on gun violence and what we can do to prevent gun violence, but is also to register more people to vote," says Matt Deitsch, chief strategist for March For Our Lives. The movement will not be endorsing any candidates on the tour. Organizers plan to stop in places that have been affected by gun violence and also areas where there is a strong pro-gun culture. Andy Bernstein heads the national non-profit HeadCount which partners with recording artists like Jay-Z, Pearl Jam and the Dave Matthews Band to register voters at music concerts. "I really think that the Parkland students have done something remarkable. They have made voter registration cool," Bernstein says. "I don't think even the most popular musician in the world can do that on their own and the Parkland kids did." Headcount registered voters at the March For Our Lives rally in Washington, D.C. in March and will do the same on the bus tour. But, by in large, young voters do not tend to show up to the polls in mid-term elections. According to the Census Bureau in the last midterm cycle in 2014, only 23 percent of 18 to 34-year-olds voted. When narrowed to 18 to 24, that fell to just under 16 percent. There are signs the anti-gun violence movement is having an impact on potential young voters, according to Kei Kawashima-Ginsberg who is the Director of Center for Information and Research on Civic Learning and Engagement (CIRCLE) at Tufts University. Crunching available voter registration numbers through June 13, she and fellow researchers discovered there is evidence of young registrants getting more engaged in the political process. "What we did find was that in a lot of states the youth registration numbers actually exceeded the numbers from the November of 2016," Kawashima-Ginsberg says. "And that's really significant because young people mostly register to vote in September and October of the election year." A Harvard University poll released in April showed that 77 percent of 18 to 29-year-old likely voters said that gun control is an important issue for them in the 2018 elections. Republican strategist Doug Heye praises how the Parkland activists have been able to sustain the gun discussion for this long, but says that the mid-term elections are still five months away. The test, he says, is whether these young activists can exceed the voting intensity of second amendment right supporters. "If you are a single issue voter and guns is the issue, what we've seen in the past is that it's the pro-second amendment, pro-gun voter that is almost guaranteed to show up at the polls." Matt Deitsch, the March For Our Lives chief strategist, says he is up for the challenge. "We're making voting something that is not just checking a box. It's literally you being a hero and you saving lives," Deitsch says. "That's why we have to do this."